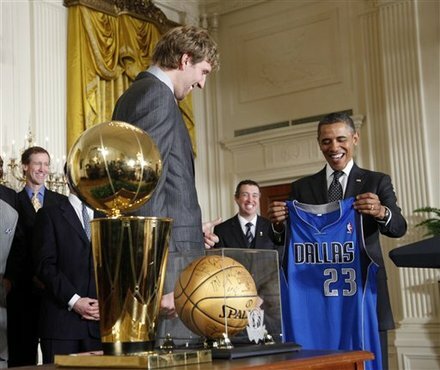 Even without a game scheduled in DC against the winless Wizards, the Mavs still got their visit to the White House in to celebrate their 2011 NBA Championship. The Big German and Obama pose as they hold up Obama's No. 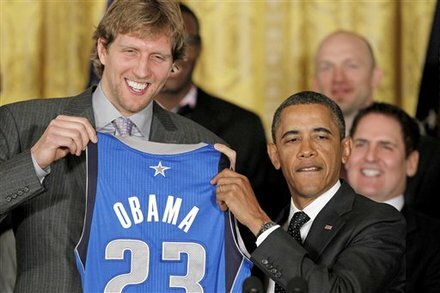 23 Mavs jersey. Obama checks out the threads of the Mavs jersey with his names on it and the No. 23. 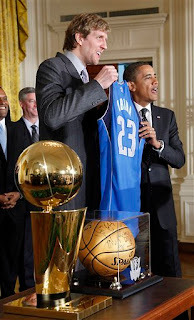 Now all Obama needs is the Bulls to win it this year while he's still in office. Now that would be something nice to see.